Designed for freeze and condensation protection, Watlow's enclosure heaters are rugged, reliable and safe to operate. 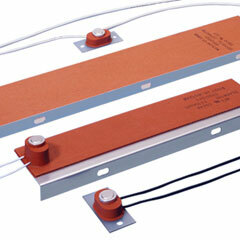 These rectangular-shaped, wire-wound silicone rubber heaters can be ordered by themselves with adhesive or vulcanized to an aluminum mounting plate. A thermostat can be attached to the heater or mounted separately. Pictured are units with thermostat on heater in foreground and heater with remote thermostat in background.